This is the time of year when the bounty of Summer comes to our tables through the harvest of fruits and vegetables that we love. 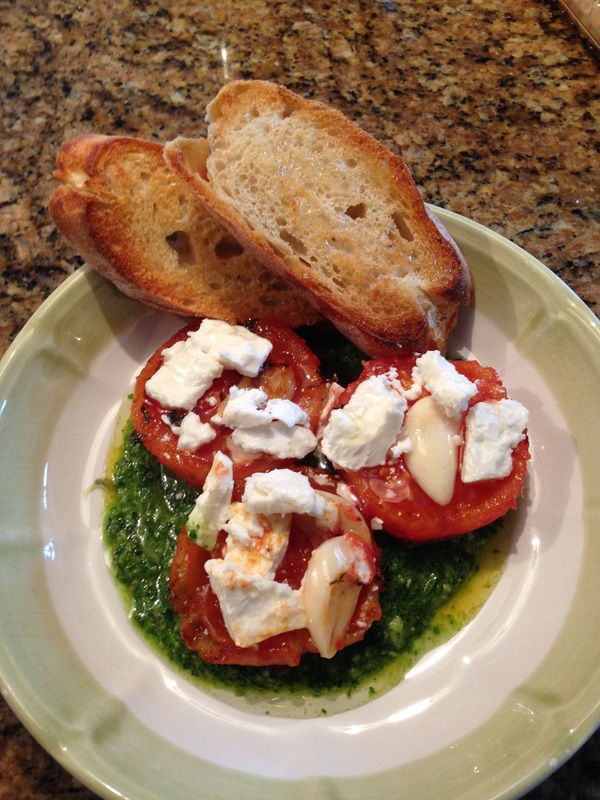 Tomatoes and Basil are such good friends that we just had to create a meal that allows them both to shine. For the Pesto portion of this dish please refer to our recipe for Pesto right here on our blog. Not only is this dish something you can make in 20 minutes, its healthy and delicious too. You won’t have to worry about having too many tomatoes on hand once your family tastes this flavorful dish. It’s great when two star ingredients come into season at the same time. 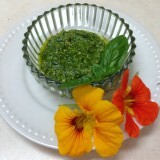 Our Basil is doing so well in our patio pot, that making fresh pesto takes only moments. We also have some nice lemon thyme and fresh oregano in pots so we have incorporated them just to kick the flavor up a notch. Heat the oil and garlic in a non-stick pan until the garlic just begins to brown. 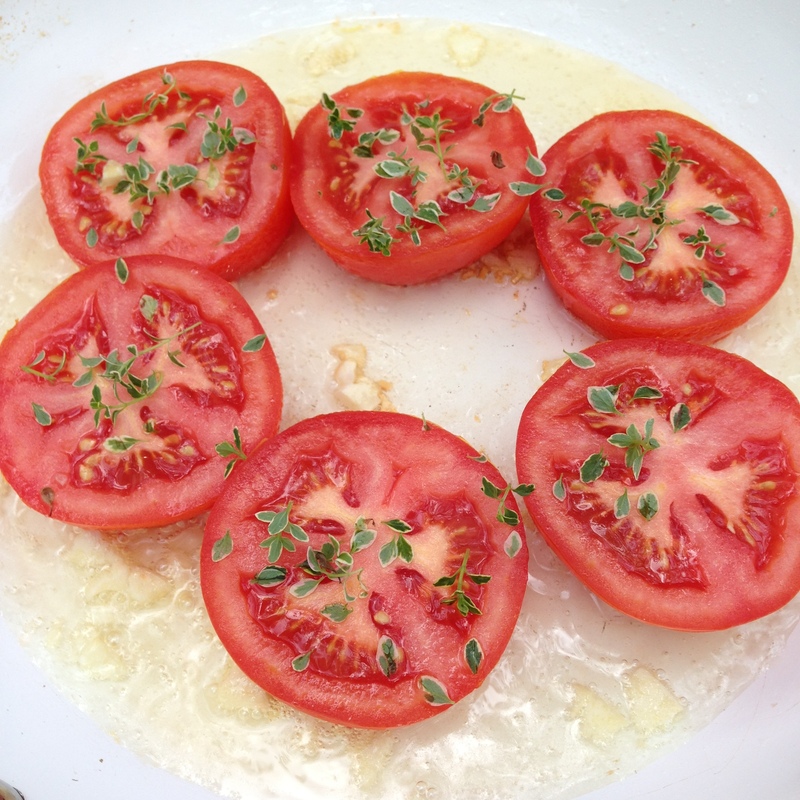 Add the tomato slices sprinkle on the thyme leaves and fry until brown, turn and fry second side. Once the tomato slices are well browned, top with the crumbed cheese and turn off the heat. To serve, place the tomato slices on a plate, spoon over a bit of the pan juices. Add your tiny oregano leaves for garnish. Surround the tomato slices with your pesto and serve with fresh bread to mop up the gorgeous juice. This makes such a satisfying lunch all by its self or with a side salad. 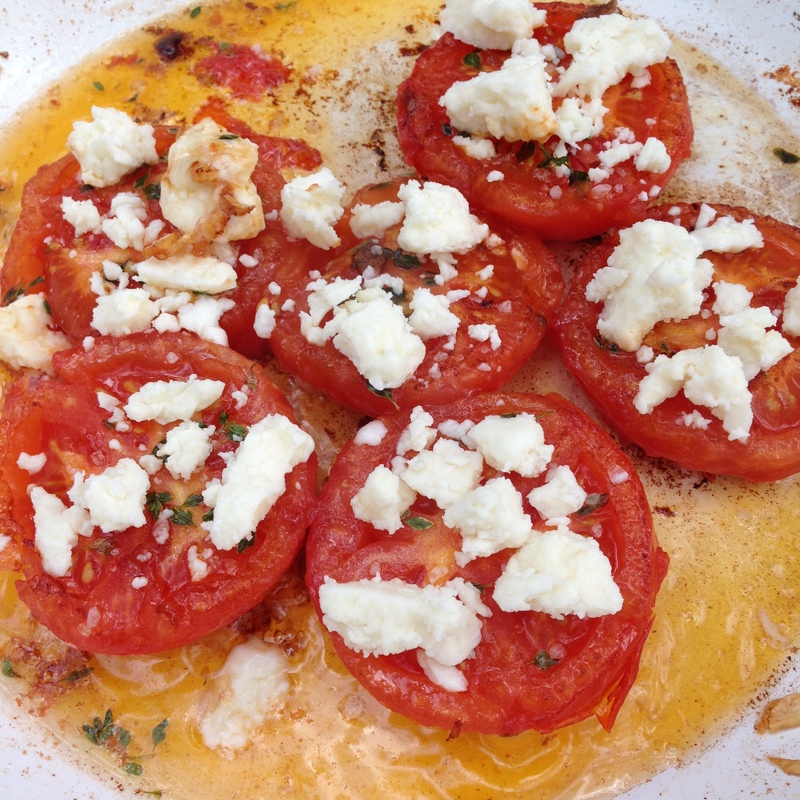 We hope you’ll give it a try the next time you see those luscious tomatoes at the Farmer’s Market! Let us know what you think of this lunch suggestion by leaving us a comment in the handy form below and don’t forget to share those recipes that you love with your friends on Facebook! This entry was posted in Brunch, Farmer's Markets, Lunch, Meat Free, Summer, Uncategorized, Vegetables and tagged farmer's market finds, Fresh food, Friend ripe tomatoes, friend tomatoes, lunch idea, Tomatoes with Feta cheese, Tomatoes with Pesto, Tomatoes with thyme, vegetarian lunch. Bookmark the permalink.